BeauxJax Crafthouse co-owner Beau Hays. The latest addition to East Bank is the realization of a 14-year-long dream. 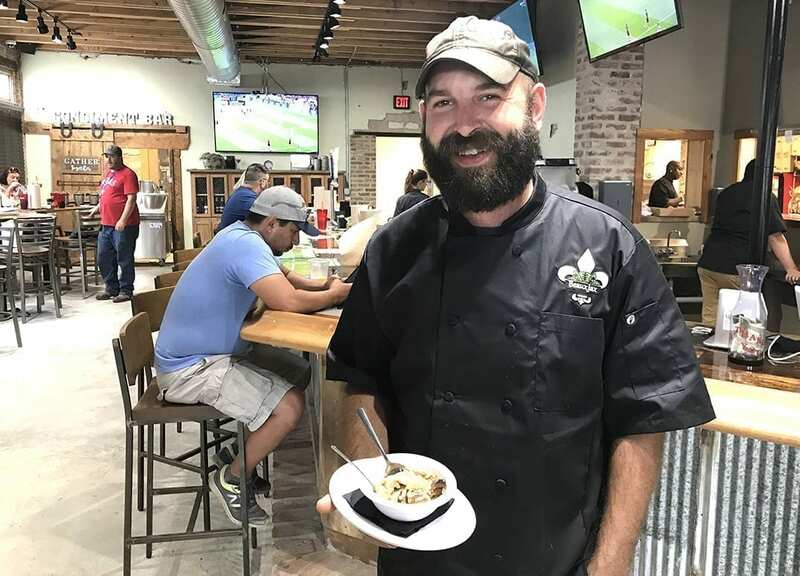 “The very first time owning my own restaurant was brought up was when I was an assistant manager at Texas Roadhouse back in 2004,” said BeauxJax Crafthouse co-owner Beau Hays. BeauxJax Crafthouse and Rougaroux Bar opened in Bossier City’s East Bank District July 12. The casual dining, Cajun-themed restaurant will feature a large bar offering beer, specialty cocktails and adult shake options with live music, and indoor and patio seating. The bar is an adjoining 21-and-up game room to feature a saloon style bar, pool tables, darts and video poker. Even though it took more than a decade to reach this point, it’s still been a process that started not all that long ago. BeauxJax began with a food truck in 2015 and a commissary on Cross Lake in Shreveport. They began catering across Shreveport-Bossier before they gained a foothold in Bossier by taking their food truck to neighborhood subdivisions in north Bossier and then started catering to employees of CSRA, now GDIT. “This side of the river has cleaned up their old downtown, parking is free and easier, and we have access to I-20. We’re close to the casinos and Louisiana Boardwalk,” Hays reasoned. Hays said they also wanted somewhere suited to local, homegrown businesses. Plus, he said Bossier City has been crucial throughout the process. For someone whose dream as an eight-year-old was to own a restaurant, it’s been a winding journey to this point. One that almost never came to be. Now that his dream lives as a brick and mortar restaurant and bar inside a repurposed building, the realization hasn’t hit him yet. “We haven’t slowed down enough to where it’s sunk in. We’ve gone from 24-hours per day working on getting the restaurant ready to open to working 24-hours per day at the restaurant. Eventually it will sink in,” Hays said. The reaction from their customer base has been overwhelming for the owners, with clientele from the subdivisions they frequented in the food truck making their way to East Bank. “This is their first time seeing (the East Bank District) since it’s been redone. They’re super excited. It’s a whole new batch of people checking out East Bank,” Hays said. For those eyeing a lunch or dinner at the newest eatery in the newest part of town, Hays want them to know they should come ready for a good time. We had food catered from them at an anniversary party Saturday and it was excellent!